Carte de Colombie et des Guyanes. 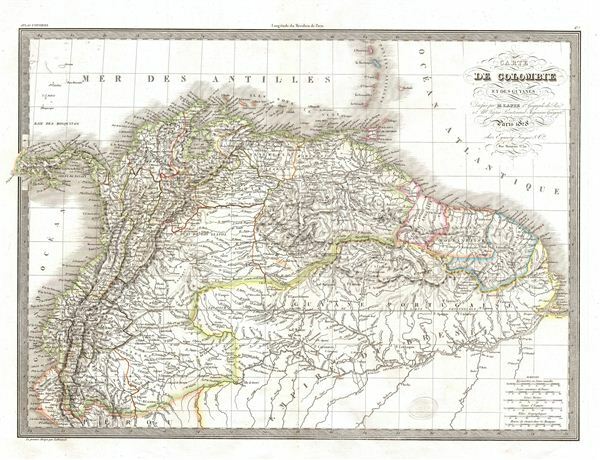 A fine first edition example of M. Lapie's 1828 map of Colombia and Guyana. The map covers all of Colombia from the Caribbean Sea in the north to Peru and the Brazil in the south. Lapie's map offers fine detail throughout with elevation rendered by hachure and political boundaries demarcated with outline hand color. envisioning an independent New World nation comprising all of the territories under the Spanish and Portuguese colonial rule, the Venezuelan revolutionary Francisco de Miranda suggested a consolidated South American empire by named after Christopher Columbus. The idea took hold and in 1819 the territories known as the ‘Viceroyalty of New Granada' (comprising of modern day Colombia, ecuador, Panama, and Venezuela), among the first South American region to liberate itself from Spain, was renamed ‘Gran Colombia.' The war against Spain finally ended in the mid-1820s when the pro-Spanish loyalists were decisively crushed. The congress of Cucuta adopted a constitution for the new republic in 1821. The vision of Gran Columbia, unfortunately, proved untenable and Venezuela and ecuador became independent states 1829 and 1830, respectively. This map was engraved by Armand Joseph Lallemand as plate no. 47 in the first edition of M. Lapie's important Atlas Universel. This map, like all maps from the Atlas Universel features an embossed stamp from the Lapie firm. Rumsey 2174.047. Phillips (Atlases) 754, 765.